Remote, hybrid and virtual teams are a fact of life. In fact, over 80% of teams and 90% of projects have at least some members who are not co-located with the rest of the group. Yet many project teams and their leaders struggle to create the kind of bonds and working relationships that get results. Managing a project team is difficult enough, but when your team is geographically-dispersed, it’s even more difficult. Not only do you have all of the challenges that you typically face during a project – undefined goals, scope creep and poor communication – but you also have a unique set of obstacles to overcome such as technology challenges, different time zones, building trust and relationships and more. In this powerful workshop, we work with small groups to assess their current team’s strength, speed up adoption of technology, and build trust even when people can’t get together in person. This course is ideal for: Project Managers, Team Leaders and anyone responsible for building strong, productive teams in a virtual or matrixed environment. 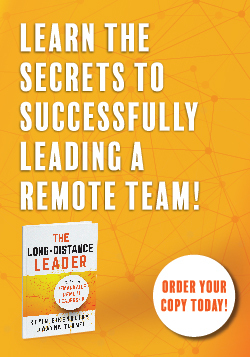 What good is saving money on time and travel if teams aren’t productive and don’t have the kind of strong working relationships that get the work done? Task completion is important but how does it help the project as a whole? Help your leaders develop core leadership skills for the way we really work today. This 2-hour workshop is a small group experience – the class size is capped at 10 participants to allow maximum interaction and learning. Course includes a pre-class assessment of their current team health in three areas, copies of the course visuals and a PDF, re-printable, packet of planning tools they can use in the future.